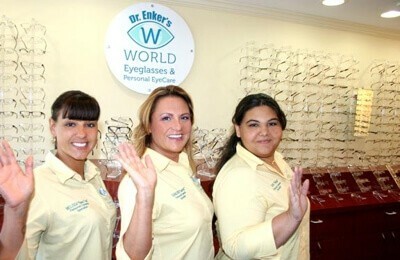 World Eyeglasses is Fort Lauderdale’s leading designer eyeglasses store with a vast selection of over 3,000 frames to choose from! Looking for a discount? We have better prices than even most eyeglass chain stores. We offer a 100% guarantee on all eyeglass frames, lenses and services. We’ll even pay for your eye exam with a minimum purchase of $99.98 for a pair of glasses. Not sure which frames look best on you? Try our helpful Eyeglass Frame Guide! stylish designer looks from Italy, France and Germany. Our frames have a 2 year warranty ‘bumper to bumper’. Most glasses can be ready in about an hour (additional fee may apply). We also offer progressives and transitions. HMO’s and insurance accepted. Our huge selection of designer eyeglasses changes all the time, so we welcome you into our Fort Lauderdale eyeglass store and vision center to try them on for yourself! Call (954) 491-7141 if you have any questions or would like to schedule an eye exam. Serving Broward County since 1991!